The sporty Lexus RC coupe was introduced at the 2013 Tokyo Show, and the upcoming RC F is its torrid sequel. Since 2008 an F suffix for any Lexus vehicle designation indicates high performance (think F for Faster), and the RC F would seem worthy of the label. Faster is a certainty. The RC coupe will be offered with a choice of a hybrid powertrain (176-horsepower four-cylinder augmented by a 105-kilowatt electric motor, total system output of 217 hp); or a 314-hp horsepower V6. Presented at January's North American International Auto Show in Detroit, the rear-wheel-drive Lexus RC F will be propelled by a 5.0-liter V8 rated for at least 450 horsepower, according to Lexus, and 383 pound-feet of torque. The V8 will be mated to an 8-speed automatic transmission with a manual operating mode via steering wheel paddle shifters. Lexus calls it Sport Direct Shift, or SPDS, and it will send power to the rear wheels via a torque vectoring differential, sending power to the loaded rear wheel in cornering. The new differential is a first for Lexus. The engine, billed by Lexus as its most powerful current V8, is unusual in that it is capable of operating in two cycles: Otto cycle, which is common to most gasoline internal combustion engines, and Atkinson cycle, which essentially reduces power and, of course, fuel consumption. Otto cycle mode is there when the driver demands everything the engine has to give, Atkinson for more relaxed driving conditions. Although the objective for this interesting bit of technology is obviously optimizing fuel economy, Lexus was not ready to make any mpg forecasts for the new engine. On the other hand, Lexus was ready to forecast top speed potential: 168 mph. Acceleration potential remains to be seen. Based on a modified GS sedan platform, the RC F will weigh less than 4000 pounds, according to Lexus, but power-to-weight specifics weren't available at the Detroit show. Other RC F mechanical distinctions include enhanced chassis rigidity, firmer suspension tuning, 19-inch forged aluminum alloy wheels, Brembo brakes with big rotors, and an active rear wing that deploys at 50 mph. Both the wing and torque vectoring differential contribute to increased cornering capability, and drivers can choose between three operating modes: standard, slalom, and track. The dynamic difference between slalom and track settings probably has to be experienced to be understood. Another indication of the RC F's sporty character can be seen in the instrumentation, which includes a monitor gauge for the torque vectoring differential, a stopwatch, and a g-force meter to track tire adhesion during hard cornering. The interior is also distinguished by a set of bucket seats with oversize thigh and torso bolsters, as well as extra high seatbacks. Like the standard RC, the RC F features a huge version of the trademark Lexus spindle grille, an interpretation that definitely qualifies as bold, whatever else one may think of it. Unlike the standard RC, though, the F has functional side vents that contribute to cooling, and underbody panels to improve airflow management. For owners who want their cars to look even racier, Lexus will offer a carbon fiber package, which includes a roof panel and rear wing, with a clear coat finish. 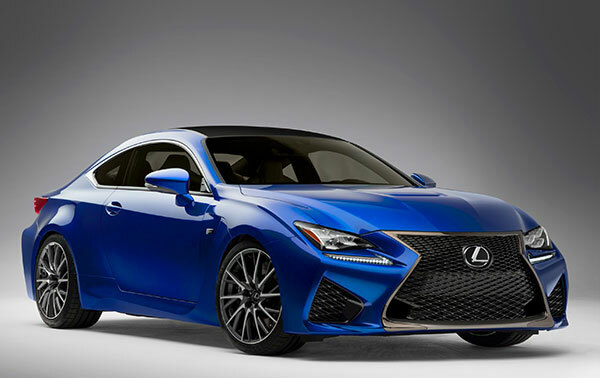 The RC F is expected to be in Lexus showrooms by this fall. Pricing will be announced closer to the on sale date.